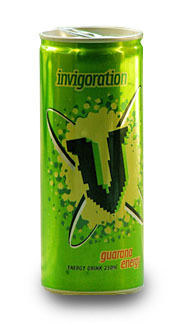 V is an energy drink from down under, produced by Frucor Beverages Ltd. (a New Zealand-based manufacturer and marketer of innovative beverages) since August 1997. V has a market share over 60% in New Zealand and 53% in Australia, making it the most popular brand of energy drink in both countries. V is available in four varieties, each sold in both 250 mL cans, 350 mL glass bottles and limited edition 300 mL aluminum bottles. V is also exported to the United Kingdom in cans, where it has seen increasing popularity since 2001.